Over 70 special events two weeks preceeding the Kentucky Derby. We stretched a famous two minutes into a month-long party. What the Run for the Roses is to horse racing, Louisville’s Derby Festival is to community celebrations. The Festival is one of the premiere events of its kind in the world and a proud five-time winner of the International Festivals & Events Association award for Best Overall Festival. It brings fun, excitement, international recognition and a spirit that is unmatched anywhere. When 1.5 million people gather to celebrate spring and the unique vitality of their community, the focus is on fun and the whimsical. “We are a community organization of 4,000 volunteers who work all year to provide quality entertainment that enhances the community,” said Festival President and CEO Michael E. Berry. Produced annually since 1956, the Derby Festival has become a whirlwind of more than 70 special events. The Festival blasts off each year with the Opening Ceremonies – Thunder Over Louisville, one of the nation’s largest annual fireworks extravaganzas! The ensuing two weeks of excitement and entertainment promise something for everyone. For sports fans there is basketball, volleyball and golf. For music lovers the concerts are almost non-stop. With two-thirds of the Festival events free, families can enjoy numerous just-for-kids activities without stretching their pocketbook. Other highlights include a half and full marathon, hot-air balloon events and live bed racing! The Great Steamboat Race pits historic paddle-wheelers on the mighty Ohio River. The event that started it all, the Pegasus Parade marches down Broadway. 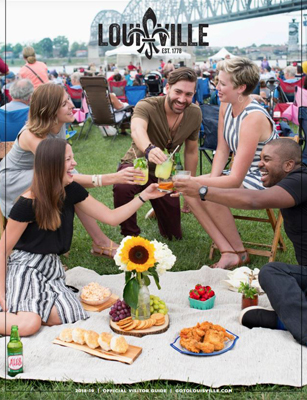 With outdoor concerts at Kroger’s Fest-a-Ville and the elegant Fillies Derby Ball, dance and dress range from frivolous to fancy. The Festival includes several formal affairs, as well as casual, foot-stomping good times all around the community. From elephant ears and corndogs at the Chow Wagon to ethnic foods and pet-friendly cocktail hours at Kroger’s Fest-a-Ville and local wine-tasting at WineFest, culinary adventures abound. More than just being entertaining, the Derby Festival generates in excess of $127.9 million annually for the local economy. Events on the Festival schedule also help to raise nearly $300,000 for area charities each year. The Commonwealth’s largest single annual event, and one of Louisville’s most popular entertainment attractions, the celebration is produced by Derby Festival, Inc., a private, nonprofit civic organization with a professional staff of 23 and a volunteer board of 75. “We know we have done our job well by the smiles of the people who attend our events,” said Berry. Smiles that stretch on endlessly. One of the countrys largest outdoor volleyball tournaments. Contributing Sponsors: ASICS and Mikasa. For more information call The Volleyball Connection/Tandem Sports (502) 582-3530.